Question: When is a bunion not a bunion? 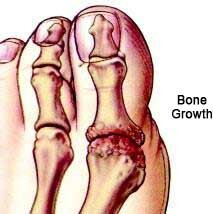 Answer: When it’s an arthritic big toe joint. 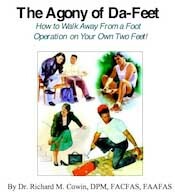 The normal range of motion for a big toe joint is 65 to 75 degrees of dorsiflexion (upward movement) and 30 to 35 degrees of plantarflexion (downward movement). 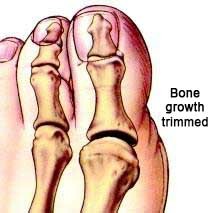 When this movement is restricted due to deterioration of the cartilage in the big toe joint and/or the formation of arthritic bone spurs around that joint, the condition is called hallux limitus (limited big toe joint movement). Many podiatrists and orthopedists treat these conditions by removing some of the bone(s) in the big toe joint and inserting “joint implants” which can be made out of plastic, metal, or both. Dr. Cowin strongly recommends against the insertion of these devices in the foot. For most cases of hallux limitus, a minimally invasive procedure called a Valenti Arthroplasty can be performed through a tiny incision to remodel the arthritic spurs and big toe joint, allow an improved range of motion. At right are illustrations of this procedure before and after treatments. For more severe cases, such as hallux rigidus, a small portion of the base of the great toe can be removed in a technique known as a Keller Procedure. Both of these procedures can be performed on an outpatient basis at Modern offices of Laser Foot Surgery Specialist.